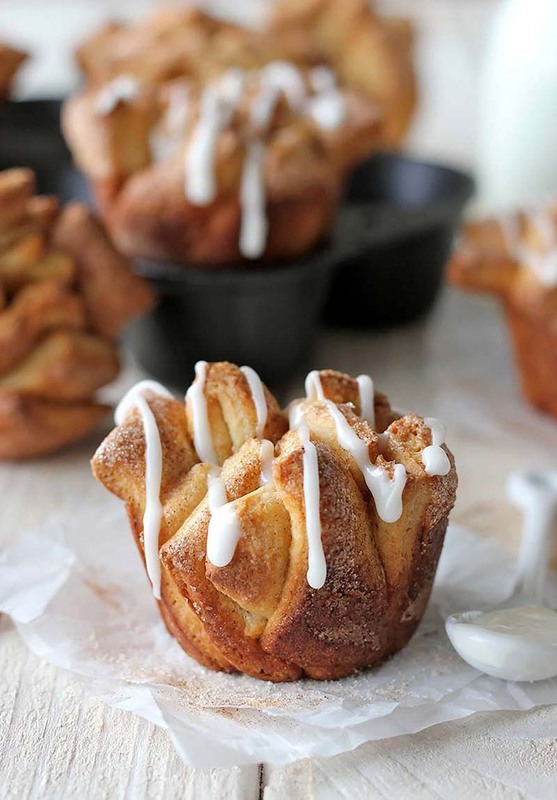 Layers of cinnamon and sugar are stacked inside each roll, and topped with a drizzle of rum glaze. Melt butter in a medium saucepan over medium heat. Cook, whisking constantly, until the foam subsides and the butter begins to turn a golden brown, about 3 minutes. Remove from heat and stir in milk. In the bowl of an electric mixer fitted with the paddle attachment, beat 1½ cups flour, sugar, yeast and salt on medium-high until well combined, about 1 minute. Gradually add brown butter mixture and vanilla at low speed, beating just until incorporated. Beat in eggs, one at a time, until well combined. Using the dough hook attachment, add remaining flour, a little at a time, until the dough starts to come together. Knead on high speed until the dough gathers into a ball, about 2 minutes. Cover with plastic wrap and let rise in a warm area until doubled in volume, about 20-30 minutes. To make the cinnamon-sugar filling, combine sugar, cinnamon and nutmeg in a small bowl; set aside. Gently punch the dough down to deflate it. Roll the dough out into a large square, about 16 x 16-inches. Brush the dough with melted butter and sprinkle with cinnamon sugar in an even layer. Using a dough scraper or pizza cutter, slice the dough vertically into 8 equal strips. Stack the strips on top of one another and slice the stack into 8 equal slices, cutting them into 2-inch squares. Coat a standard muffin tin with nonstick spray; set aside. Layer the dough squares evenly into the muffin tray. Loosely cover with plastic wrap and let rise in a warm area until doubled in volume, about 45 minutes. Preheat oven to 350°F. Place bread into oven and bake for 15-20 minutes, or until golden brown. To make the glaze, combine confectioners’ sugar, butter, milk and rum. Whisk until smooth. If the glaze is too thin, add more confectioners’ sugar as needed. When the pull-apart bread is done, cool for 10 minutes and drizzle the glaze on each pull-apart bread. Recipe created by Damn Delicious. I bought the Platinum at a grocery store, and I never thought to check the expiration date… it had expired more than a month ago! However, it still worked beautifully! Red Star never lets me down! All of the recipes I’ve tried are excellent! I have always had good luck with this yeast, even near expiration date. Any of the coffee cakes sound great.